[prMac.com] Frankfurt, Germany - Eltima Software is proud to announce the release of Cargo VPN 1.0, its latest product for Mac OS X. Cargo VPN is a great privacy solution for the websites you visit, your IP address, geolocation, as well as personal communications for your Mac. Maintaining your privacy is becoming harder and harder when you venture out on the endless Internet fields. With Cargo VPN, users can forget about their IP address, geolocation, or personal data being visible to various tracking and malware websites. Using correct VPN setup for different situations can help you save on flights, hotels, and rental cars. This is because a lot of dealers price their services differently for different geolocations. Cargo VPN 1.0 for Mac is Free (with in-app purchases and subscription based) and available worldwide through the Mac App Store in the Productivity category. 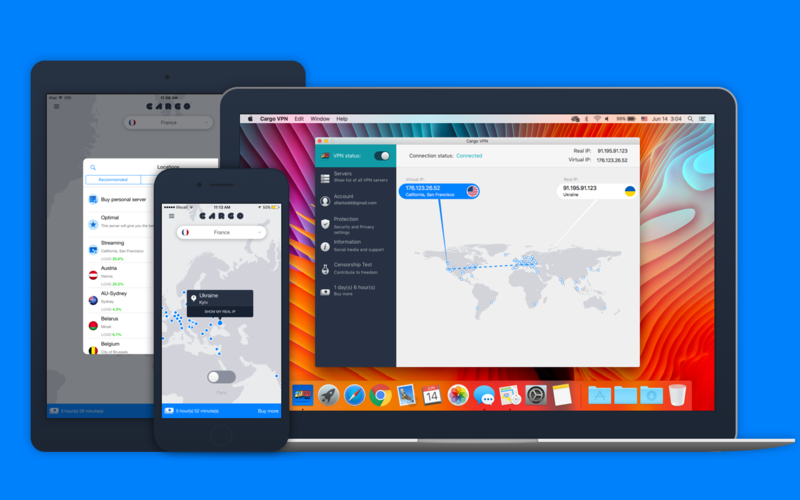 The app is probably the best VPN for Mac with all security features, flexible settings, and a free full-featured 24-hour trial. Offered subscription plans include 1 month: $9.99; 1 year: $49.99 ($4.17/mo); as well as 3 years: $99.99 ($2.78/mo) USD.